GREECE'S MOST POPULAR MOVIE STAR, ALIKI VOUGIOUKLAKI. - OLYMPIAKOS - OFI: WHICH ONE WILL GET THIS CUP?. / 1 PAGE, 2 PHOTOS. - SOPHIA LOREN, GINA LOLLOBRIGIDA, CATHERINE DENEUVE: THE ETERNAL BEAUTIES TV SERIES. ON COVER: BROOKE SHIELDS & CHRISTOPHER ATKINS IN . CHRISTOPHER ATKINS & BROOKE SHIELDS IN . IN GOOD CONDITION. IN EXCELLENT CONDITION. BACKSIDE TEXT IN GREEK LANGUAGE. US Weekly June 13, 1991. Madonna cover story. Also features Brad Pitt and Patrick Swayze. Very good condition. HEBREW MAGAZINE FROM ISRAEL 1987. AND John IS ON COVER. Collectible Back Issue -September 3rd, 1990 - Elizabeth Jolley. The New Yorker Magazine . Crisp covers and only light cover wear & mild interior fading, as pictured. No markings or missing pages. 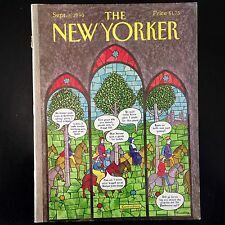 The New Yorker Magazine (Sep 3, 1990). RARE MAGAZINE IN HEBREW, IT IS FROM ISRAEL 1988. MAGAZINE IS COMPLETED and PERFECT. RARE MAGAZINE IN HEBREW, IT IS FROM ISRAEL 1987. RARE WEEKLY MAGAZINE FROM ISRAEL 1986, HEBREW LANGUAGE. ANDREW Wham RIDGLEY IS ON COVER. This is a 1992 issue of The REN & STIMPY SHOW Exposed Magazine. It is a special Collector's Edition made by Nickelodeon and it gives rare insights, stories, and rare never before seen drawings of the early versions and ideas for the show. MAGAZINES : ROBOTECH LA TRAMPA #001. COVER : ROBOTECH. DATE : 1986. TOTAL PAGES : 25. LEFT TOP CORNER HAS A LITTLE BROKEN. 16 pages including cover. ULTRA RARE middle Tennessee zine from 1985. CONDITION: One bent corner, mild yellowing around the cover edges, mild creasing on the back cover. MAGAZINES : GOBOTS EL TRAIDOR #002. COVER : GOBOTS. DATE : 1986. PAGES : WITH DRAWING AND TEXT. MAGAZINES : GOBOTS LA CONQUISTA DE LA TIERRA #005. COVER : GOBOTS. DATE : 1986. PAGES : WITH DRAWING AND TEXT. MAGAZINES : GOBOTS OPERATIVO TIERRA #003. COVER : GOBOTS. DATE : 1986. PAGES : WITH DRAWING AND TEXT. MAGAZINES : GOBOTS LA BATALLA POR GOBOTRON #001. COVER : GOBOTS. DATE : 1986. PAGES : WITH DRAWING AND TEXT. Sheena IS ON COVER. MAGAZINE FROM ISRAEL 1980. IT IS IN HEBREW LANGUAGE. HEAVY HEBREW MAGAZINE FROM ISRAEL 1992, FEW IMAGES IN INNER PAGE ARE BESIDE THIS LOVELY COVER. GREAT CONDITION.FEW MISSING PAGES ARE NOT Madonna RELATED. MAGAZINE IN HEBREW FROM ISRAEL 1998. HEBREW MAGAZINE FROM ISRAEL 1999. CONDITION: MAGAZINE IS USED, IT LOOKS GREAT. It was Bought as a Collectible and Not too Use. It Features Super Mario Lemieux on the Cover. It Covers the NHL Playoff Preview. This would be a Great Item to Add to your Penguins Hockey Collection.This would Make a Great Gift or for Yourself. HEAVY HEBREW MAGAZINE FROM ISRAEL 1992 . 5 HEBREW MAGAZINES FROM ISRAEL. MAGAZINES ARE USED AND LOOK THEY ARE IN GREAT CONDITION. TWO FROM 2000, ONE FROM 2003 AND ONE FROM 1995. Flight 232 : The Survivors Gripping Stories; Vietnam; and Drugs Children of Poverty. Browse the Other Issues in Our Life Magazine Collection Here! People Weekly Magazine Collectors' Edition "The Diana Years: From Her Dazzling Debut to the Divorce and Beyond" Photo Special, 1996. HEBREW MAGAZINE FROM ISRAEL 1986. CONDITION: MAGAZINE IS USED, IT LOOKS GREAT. WILL SEND WHOLE MAGAZINE BUT IT MISSING THE COVER. Madonna US Weekly June 13, 1991 Article w/Photos Rare No Promo Poster HTF OOP!!! Very Good Near Mint Condition! Before is Gone! THE SPIRIT OF JOHN PAUL II. Insight MAGAZINE. September 7, 1987 issue. ~~~~~~~~~~~~~~~~~~~~~~~~~~~~~~~~~~~~~~~~~~~~~~~. ALL THE SHOW TOP STORIES WITH AMAZING PHOTOS FROM YOUR STARS & SOAP SERIALS.